We didn't do much out of the ordinary this week. We all became 7 days older. Everyone but me. I claim 9 days of aging because I spent much of Friday calling health insurance agents & billing reps to straighten out our plethora of claims. They are not straightened, but they are straighter. In that time I aged 2 extra days. If you don't know what I'm talking about, you have never tried to coordinate two sparring insurance companies, health bills that replicate like Tribbles, and over $100,000 in expenses -- all while keeping your baby happy. If you DO know what I'm talking about, I'm very sorry. 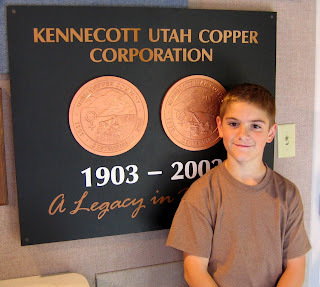 Our one expedition was to the Kennecott Copper Mine with nephew/cousin Tyler on Saturday. I believe everyone enjoyed the experience. 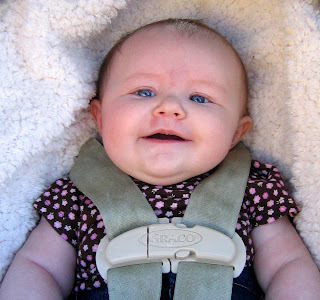 I figure Bridgette liked the car ride the best because she slept both ways. Tyler seemed particularly taken with the gift shop and the movie in the visitor's center. Jeff and I just liked being out together. The gigantic Hole-That-Was-A-Mountain was fascinating too. This tire costs $25,000. There are six on each dump-truck, and each tire must be replaced every year. Here is one of the many, many dump-trucks servicing this open-pit copper mine. 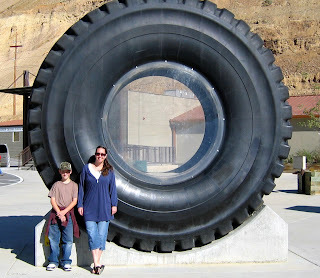 You can see how big the mine is when a dump-truck with six large (and expensive) tires looks so small. There are several more dump-trucks on the other side, but they look so tiny that they're barely visible, even when you expand the photo. 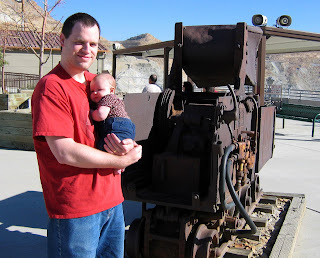 Here is an old dump-cart that was used when the mine was first opened. The times, they have a-changed. Because they're close-ups with no specific reference point, I've always thought Bridgette looks chunkier in the photos posted on the blog than in real life. 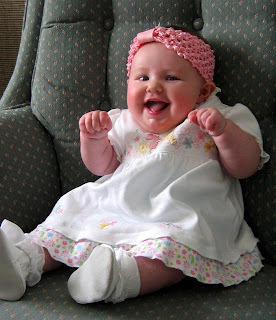 However, at church on Sunday, someone said, "She looks chubbier in person than on your blog." I suppose it's a matter of perspective. Or is it? Look! I'm wearing some of the shoes you sent me! I was really taken with the one on the right. In my mind, the one on the left doesn't actually exist. Can you believe Mom finally broke down and put a headband on me? I look like Rambo. In pink. I tried to take it off as often as possible, but Mom said something about red-marks-where-it-used-to-be and have-to-wear-it-now-to-cover-them-up. I'm smiling this big because you're coming to see me soon. I remember being impressed by the tires when I went there, too! I do know what your talking about, insurance-wise. I have been there. I am also many days older because of it. All I can say is that you will eventually figure this out. It will take way longer than you want or than you even think you can endure, but some day it will be over. And you will have the healthy, happy baby and the gray hairs to prove it. Isn't it amazing how many mistakes there are in medical bills. I think almost every medical bill I've ever gotten was messed up in some way or another. On another note, my grandpa works in a steel mill that has trucks with those tires, and he told me that once some molten steel spilled onto a tire and it exploded in the factory. Can you imagine how loud that was?! Yikes. Good luck with the medical bills. We call Tyler our half a million dollar baby! 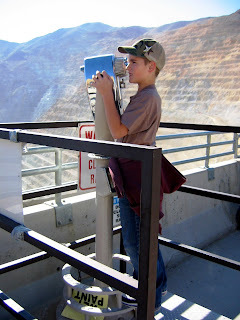 I loved the pictures from the mine. He had such a great time. He sure loves Bridgette. 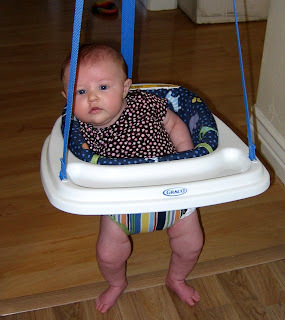 Her legs are awesome, by the way.